1871 – The Civil War has taught the nation that if it wishes to hold the Pacific Coast firmly to the Union, efficient transport will have to be provided, to limit the chance that some foreign country might annex California. Due to concerns of the Indian Reserves, construction is slow up to 1881, but then the Atlantic Pacific Railroad is rushed to completion with princely subsidies of land and money. 1930 – To counter the Great Depression, the U.S. Government finances Hoover Dam Project. Las Vegas receives thousands of depression-weary job seekers, who help build the world’s largest gravity dam. 1970 – Tourism comes of age as major economic activity, in Las Vegas and in beautiful Arizona. Works well without crashing. However even on an easy setting I am unable to complete the second set of goals. It is just about possible to complete the first set of goals. I think it would be almost impossible on a more difficult setting. Resources are just too far away. Unable to generate enough cash to keep trains running the long distances without even thinking about buying banks or hotels. Perhaps I am missing a trick on my game play although I seem OK on the scenarios that come with the game. Universum completed this map on Mogul/Hard starting in Flagstaff just a year ahead of the deadline (but said it could be done sooner with a little better planning). Amazing. This has challenged me for weeks. Finally managed all objectives on easy with no competition, with just 1/4/7 years remaining! With Barstow as a starting position you’re basically dead in the water. No resources, no trade & no money to reach anything that can generate profit. Maybe I’m missing something. This is a difficult map. Here is the forum link, it will explain….. I checked the link but found no explanation for Barstow issue. The map creator, Karsten, mentions it at one point but only in the context of that being the worst starting position. Other posters mention early developing towns on the other side of the map as essential for winning. At this point I’m just curious if one can even play the game from that location, even on easiest difficulty. This was a long time ago, and I don’t quite remember. (Something to do with passenger traffic and having Terminals ??? )But I’ll take it up with the Karsten. He is away now, so don’t expect an answer before middle of October. Thanks again Jancsika. I appreciate your input. I’ve moved on to other maps but I’m still curious. Hi Dom11 – in version 2.0 of the Arizona Canyon map it is in fact possible to win starting from Barstow, and yes, you do need to stretch over as soon as possible and develop towns on the other side of the map to gain traction and generate sufficient profits to continue. Initially, passenger traffic from Barstow to Kingman and back provides sufficient extra money to complete the first era (as Investor or Financier). I have added a route map to the original thread (quoted by Jancsika above) to show what I mean. 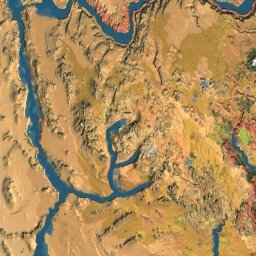 Sorry, I mean version 2.2 of the Arizona Canyon map, available for download in the first post of the thread linked by Jancsika above. I just checked the two files, the one here should be 2.2. Great map, very challenging. The hardest objectives to hit are the second set and it took me several tries at investor level to hit it. Map crashes when loading :/ I have latest patch and win xp any suggestions ? I’ve updated the map to Karsten’s latest version. Are there supposed to be small villages all over that done produce nor accept any goods? I also managed this on Robber Baron, starting at Phoenix, hard routing with no AIs, with all objectives met 4 years before deadline. Could have finished earlier but didn’t realise in time that hotels weren’t adding directly to net worth. Agree with the above comment that lots of hotels is the secret. Great map Karsten – it has kept me entertained for days! Hardest part was wood to Needles and passengers to Ash Fork in second phase – achieved this with a loop rail similar to that suggested for the Uganda map – great tip, thanks. ii) it is not possible to meet the second set of objectives after meeting the first. You have to wait too long to raise the cash to caterpillar-track to Phoenix to get to the money machine required to establish the vast network of track required. That being said, I am willing to stand corrected if someone can prove that they’ve done it! Loved the look of this. It loaded OK but no track shows up while playing. This is a great map with nice scenery and challenges. I have played all the starts. Barstow simply isn’t possible if you can’t manage to connect to Kingman. At Mogul level, I just managed the connection by spending almost nothing on leveling a very direct track. The rest is easy. I start Ash Fork on RB with a siding to allow two Moguls running mixed to deliver food out through Flagstaff to the ranch. To make it to Needles I have used the cheap track patent. Most of the patents help some and an early lubricator may be winnable without it. Flagstaff is easier and doesn’t require the cheap track because a terminal there is more valuable as AF grows sooner and requires less track as you can also “cheat” by not going right down the hill. This makes it possible to start off owning the AF Stockyard. Been using sidings, but no extra hotels. Second era, first up I double-tracked my initial line to separate express traffic. Save to connect and setup two trains for hauling wood and passengers. Works reliably with one siding in the middle. Continued saving to punch a cheap track to Phoenix money machine. Improved the line with sidings to handle six trains. A little help from partial loads will get it. When there are 3 in the station, I set 4. Without any patents ever I have completed Flagstaff on RB except for the net worth at 25M. Phoneix on RB is easy. Without any patents or caterpillar track I have done it Jan. 1954, and I could improve this if I wanted. I both love and hate the caterpillar track. Can be tedious, though, have learnt better techniques also.